Geared trolley for IPE and T beams. The trolley moves on the beam by pulling the hand chain. The wheels are equipped with duration lubricated ball bearings. 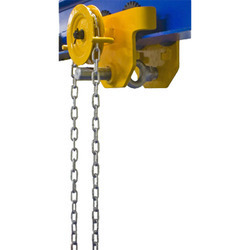 The hoist or lifter can be attached directly to the trolley eye with a hook or a shackle. Manufactured and tested according to EN 13157.